Guard your windows from graffiti vandalism at a fraction of the cost of glass replacement and repair with ABC Sun Controls anti graffiti films. 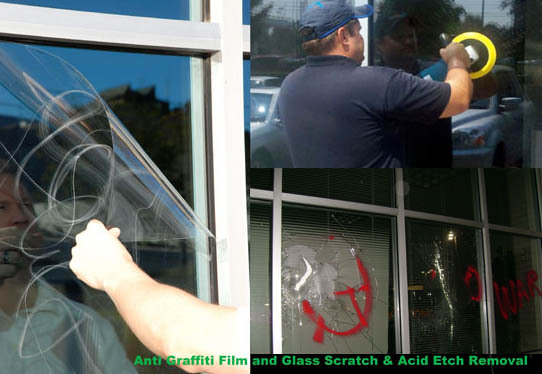 Protective Anti-Graffiti films offer an inexpensive solution to the costly problem of replacing vandalized storefront glass and public bathroom mirrors, which sadly goes to the landfill, increasing waste. It has proved especially valuable in downtown high traffic areas. It has proved especially valuable for The Gates Foundation Building, Sound Transit, Abercrombie & Fitch Key Bank, Starbucks and in downtown high traffic areas. Anti-Graffiti film is applied to the exterior storefront glass and provides an invisible barrier that protects your glass from acid etching, tagging and scribing. It also helps to hold the glass together in case of breakage as the result of rioting. In addition to providing this film we can restore glass by removing glass scratches, tagging, acid etch graffiti or hard water stains. In addition to protecting glass from potential damage and vandalism, we also restore graffiti damaged glass by removing glass scratches, tagging, as well as acid etch graffiti. 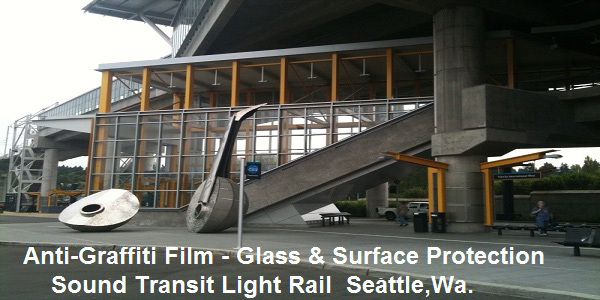 Then we also install the anti-graffiti film protecting the restored glass surface from future graffiti vandalism. Protective Anti-Graffiti films offer an inexpensive solution to the costly problem of replacing vandalized storefront glass and public bathroom mirrors. It has proved especially valuable in downtown areas where people congregate for bus stops. Anti-Graffiti film is applied to the exterior storefront glass and provides an invisible barrier that protects your glass from acid etching tagging and scribing. It also helps to hold the glass together in case of breakage as the result of rioting.